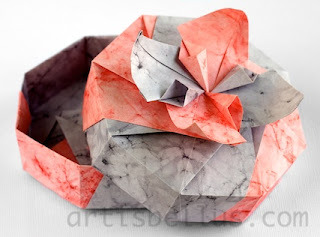 This origami box will be the perfect package for a Mother's Day gift. It's sturdy and big enough to contain sweet treats or origami jewelry. This is one of my favorite boxes. The top resembles a flower, and it has a very pleasing folding sequence. 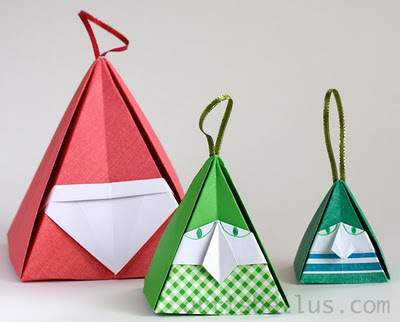 The instructions can be found in Tomoko Fuse's book, Beautiful Origami Boxes. I used A6 size (105 mm x 148 mm) rectangles of batik paper, which is a kind of decorated copy paper, 4 for the lid and 4 for the base of the box. A6 size rectangles can be obtained by cutting in half A5 size papers, which in turn can be obtained by cutting in half A4 size papers. A4 is a common copy paper size in many countries. Mother's Day is coming soon, so it's time to start thinking about folding a special gift for your mom. The Modular Flower and Leaves were designed by Michael LaFosse. 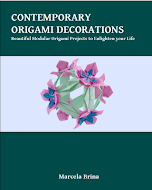 The instructions to fold them can be found in his book, Origami Art . The book has a section describing techniques to build flowers and plants, which I found very helpful. The flower consists of six modules. Both the modules and the leaves were folded with 2" (50 mm) squares of Kasugamomi washi paper. As a vase, I used a corrugation designed by Shuzo Fujimoto. The instructions are available in the book, Fujimoto World - Twist Fold, ISBN 978-4416312001 (in Japanese). I folded the vase with a 12" (300 mm) square of elephant hide paper. 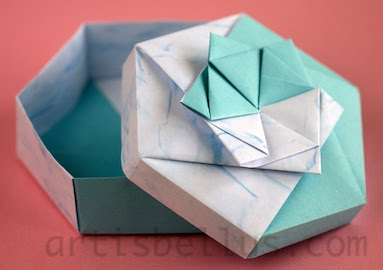 This is another beautiful box from Tomoko Fuse's new book, Beautiful Origami Boxes. I'm not sure about the name of this box (the book is in Japanese), but the top looks like a star. I folded it with A5 (210mm x 148mm) rectangles of copy paper, 2 for the lid and 2 for the base of the box. A5 size rectangles can be obtained by cutting in half A4 size papers, which is the normal copy paper size in many countries. "A series" paper sizes are rectangles where the ratio of the longer side to the shorter one is √2. 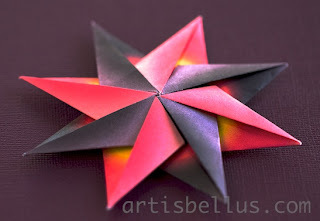 Constanze is another origami star from Carmen Sprung's book, 21Origami Sterne, ISBN 978-3000365713 (in German). Besides the original model, the book also gives intructions on how to fold two variations. Both the original model and the Variation 2 show both sides of the paper. 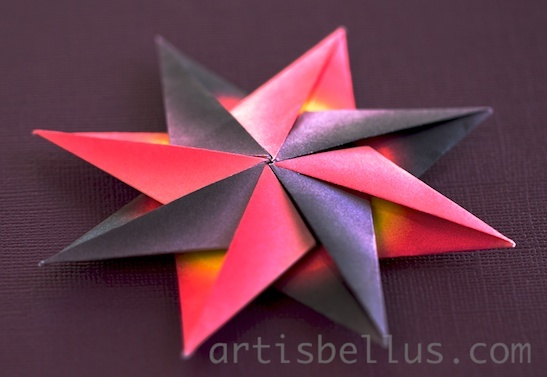 I folded the Variation 1, in which the modules only show the colored side of the paper. Constanze is built with 8 modules. 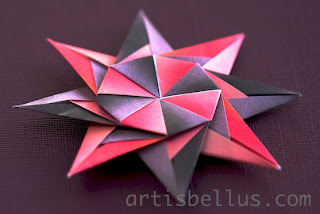 I folded it with 3" (75 mm) squares of harmony origami paper. It's also pretty if you turn it over, as shown in the picture below.